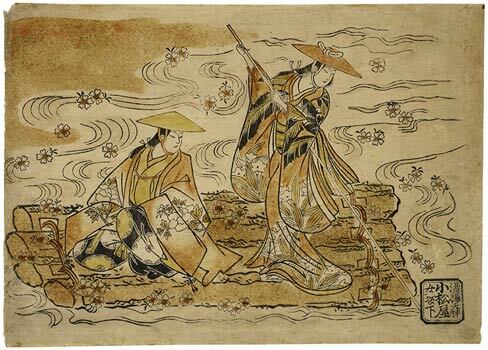 Two ladies wearing travel hats are shown on a raft viewing countless cherry blossoms on the water, most likely a literary scene. The seated figure is holding a shaku, the courtly symbol of dignity, in her right hand. The print was hand-coloured in orange and yellow (tan-e), while emphasis was given to the riverbank and raft by sprinkling metal powder on them. The woman at the left is dressed in the garments of a travelling courtier, and the scene undoubtedly refers to an incident in history or literature, the protagonists portrayed as women in an elegant parody. Most of the prints in this unusual small horizontal format which have survived were from one album with careless kambun inscriptions added with brush, inscriptions that is to say written in Chinese script, but conveying a particularly Japanese meaning. The only other impression of this print which is known to have survived was from this album. It was owned by Atherton Curtis and is reproduced in Vignier and Inada, Estampes Japonaises Primitives, no. 325, pl. 47. The colouring of the Curtis impression is generally similar, although the logs of the raft are different colours, and the seated woman’s hat is covered with ‘gold dust’, as the metallic powder on hand-coloured prints of this period is often called. The Chinese-style inscription does not identify the subject.